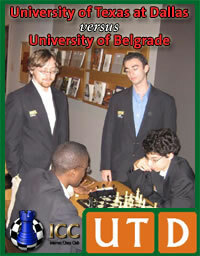 The October 20 intercollegiate battle between the University of Texas at Dallas and the University of Belgrade ended in a 8.5-7.5 victory for the Serbians. UTD Chess director James Stallings congratulates the Belgrade team, but notes that preparations are already in place for a rematch next year. "The battle for the transatlantic cup will continue! ", he says. The 16 board match was filled with brilliant fireworks, including a dazzling win by Texas State Champion Drasko Boskovic. On board 7, International Master and Finance major Amon Simutowe got crunched by an aggressive line against the Najdorf Sicilian. Freshman Igor Schneider defeated Ivan Martic on Board 9, with a clever defense. Igor played Rfe8!, and it's curtains for White, although Ivan waited till time control to resign. Both universities fielded Grandmasters on their top two boards and we traded points, with Black winning both games. Magesh Panchanathan pulled off a major swindle against Bojan Vuckovic in this game, coming back from the dead to gain the full point. Vuckovic made it harder for himself with his exchange sacrifice on move 39. Although he is still winning, Black's pawn phalanx can become annoying. 58. b4! was the winning idea, but White blundered terribly on move 59, with Ke2?? allowing ab4 60.Be6 (the bishop needs to aid the White King in stopping the pawn duo.) d3!! when Kd3 loses to Kf3. Instead of Ke2, 59.Ke1! still wins, because ab4 Be6 d3 Bf5 and White has everything under control. Many top players would have resigned in Magesh's shoes at around move 33. His resilience, combined with a bit of luck resulted in a full point! If it can happen with Grandmasters, it can happen to anyone. On Board 2, GM Alejandro Ramirez went all out for the win against Veljko Jeremic, which may have caused him to lose. See full results table and photos of all the players.